Here's the snowfall analysis since late last week, which shows the heaviest snow from our first winter storm of the season. 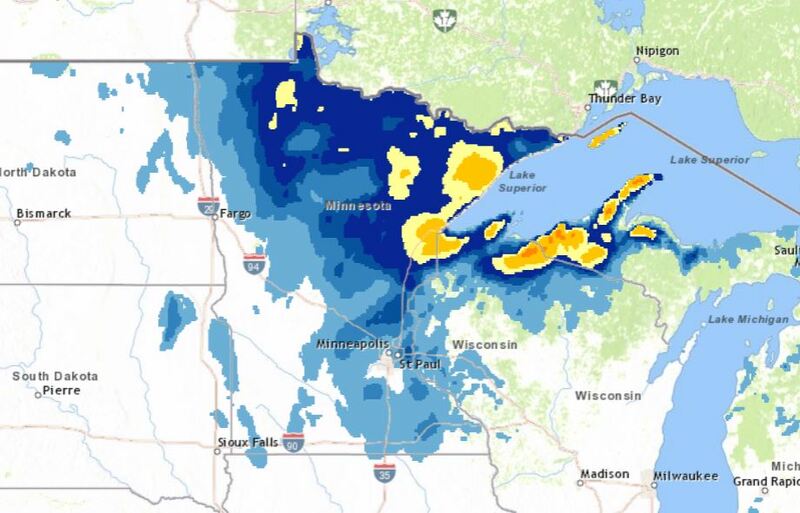 For some, it was barely a storm, but others had nearly 10" or more near Lake Superior. 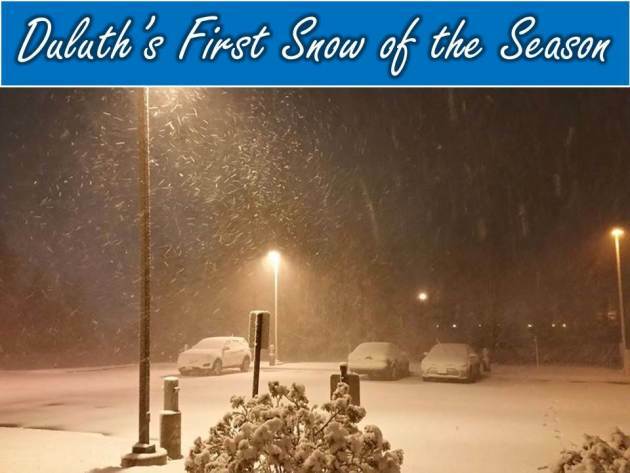 On Friday, October 27th, Duluth had 10.6" of snow, which was the snowiest October day on Record! 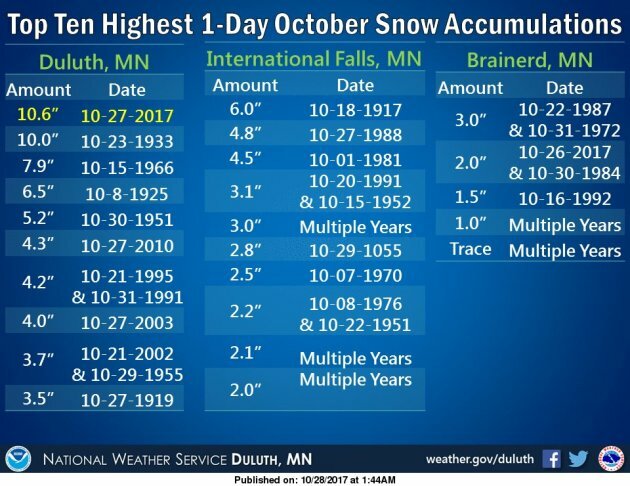 Meanwhile, the official report from the MSP Airport was only 0.1" - However - it was the first time that the Twin Cities has seen measurable snow in October in 9 years! And just like that, our fall color season has come to an end... there isn't much left out there. 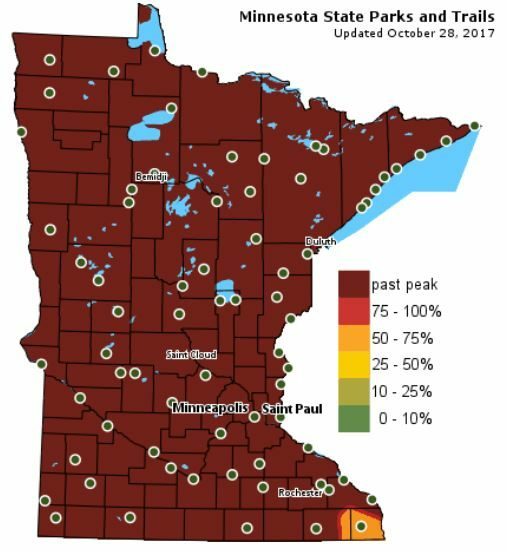 Maybe a few stubborn trees still holding onto their leaves, but according to MN's DNR, most of the state is past peak in the fall color department. 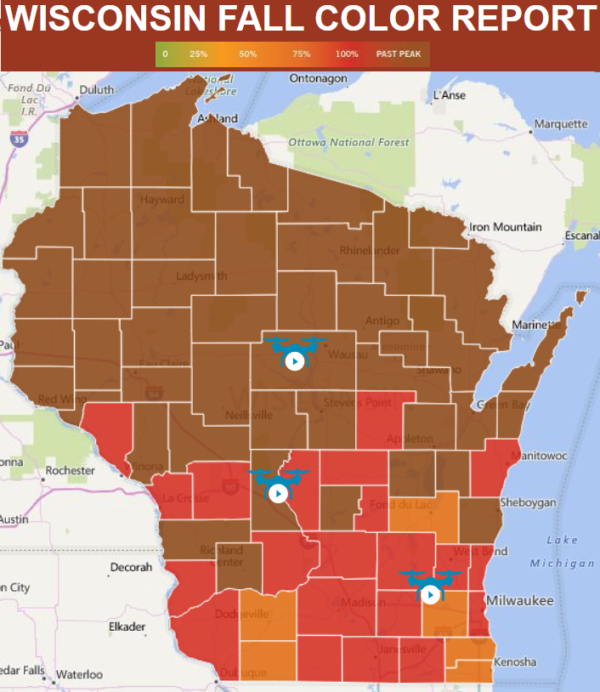 If you're still in search of fall color, you still have a chance across parts of southern Wisconsin, but it's going fast! HURRY! 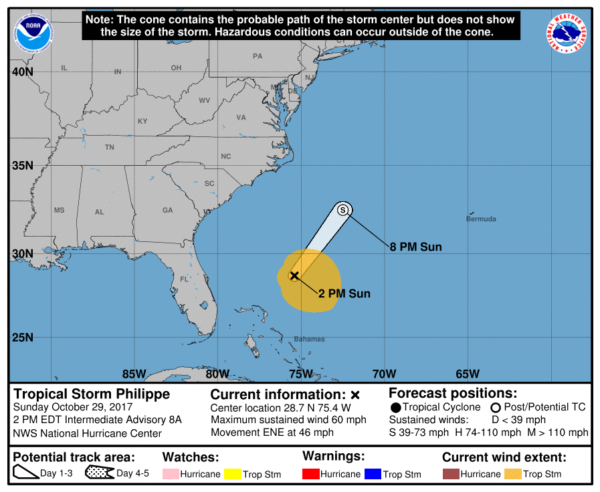 Here's a look at PHILLIPPE from Sunday afternoon, which according to NOAA's NHC was 16th named storm of the 2017 Atlantic Hurricane Season. The storm system bringing heavy rain and wind to the Northeast will continue on Monday. Peak Wind Gusts Monday. 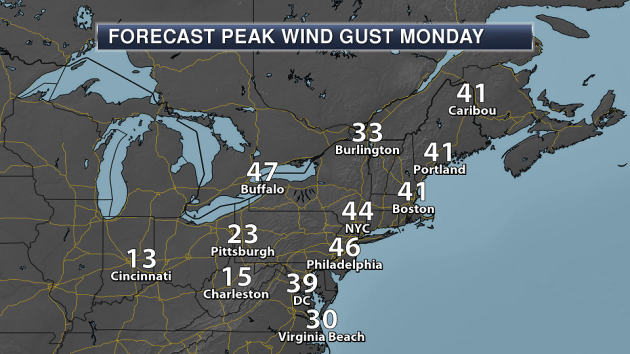 Strong winds will continue across the Northeast Monday – especially during the first half of the day - with many areas continuing to see wind gusts exceeding 40 mph. Wind Alerts. Due to the expected high winds with this system, numerous High Wind Watches and Warnings as well as Wind Advisories have been issued. High Wind Warnings include Rochester (NY), Hartford (CT), Providence (RI), Boston (MA), as well as Portland and Bangor (ME). High Wind Watches include New York City and Albany, NY. 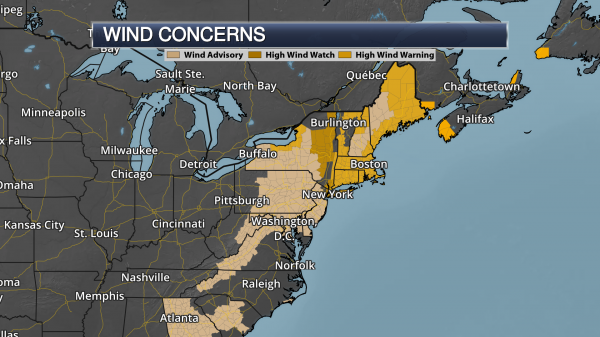 Wind Advisories include Buffalo (NY), Philadelphia (PA) and Washington, D.C. Heavy Rain Expected. As this system taps into deep tropical moisture, heavy rainfall amounts are expected across the region over the next 24-36 hours. Many areas are expected to end up with at least 2” of rain into Monday, with some 6”+ totals expected. 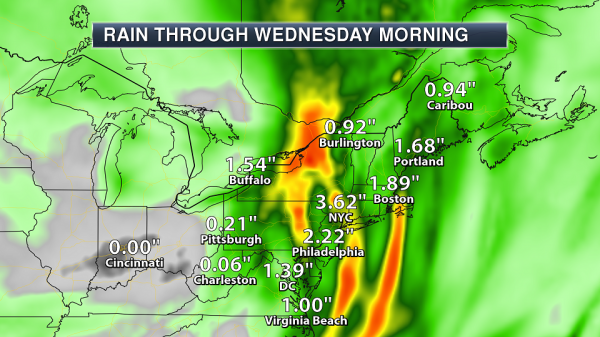 As of Sunday morning, the heaviest stripe of rain looks to fall from coastal New Jersey to upstate New York. Flood Watches. 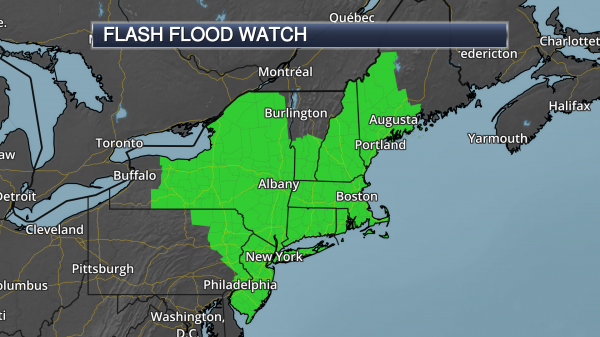 Due to the expected heavy rain – which in some areas could top 6” – Flash Flood Watches have been issued across a good portion of the Northeast. These Flash Flood Watches include Philadelphia, New York City, Boston and Portland (ME). 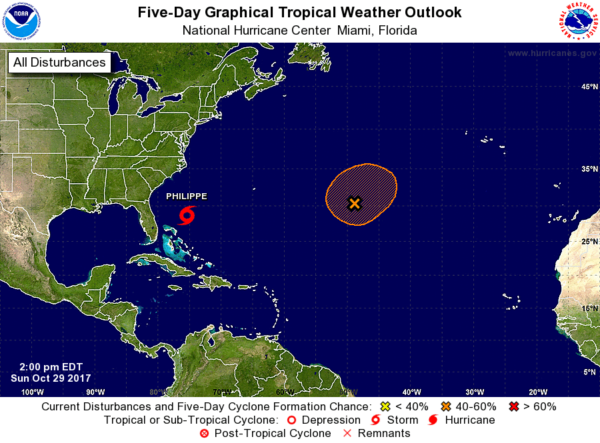 Here's the Atlantic outlook over the next 5 days, which shows PHILIPPE just east of Florida, but there is also another wave of energy in the Central Atlantic that has a MODERATE chance of tropical formation. Here's the average Atlantic hurricane season, which shows that peak activity generally occurs on September 10th and stays somewhat active through the month of October, but really diminishes through the month of November. Again, the Atlantic Hurricane Season doesn't officially end until November 30th. "Full recovery from California wildfires may take years"
"Officials say it will take at least months and likely years to fully recover from devastating wildfires that ripped through Northern California earlier this month, killing 42 people and destroying at least 8,900 structures. Sheriff Rob Giordano said Saturday "We don't control these things, and it makes you realize how small you are in the world when something like this happens." Giordano spoke before hundreds of people gathered at a college in Santa Rosa, one of the hardest-hit cities, for a memorial service to honor the lives lost. The deadliest series of wildfires in California history started Oct. 8, eventually forcing 100,000 people to evacuate. 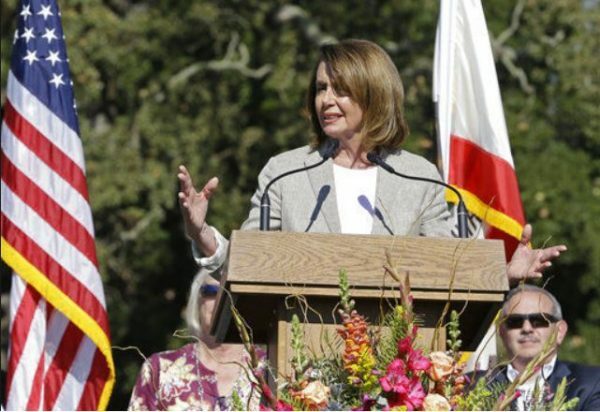 U.S. House Minority Leader Nancy Pelosi and five members of Congress attended the memorial, toured fire-ravaged areas and heard federal, state and local officials describe what Congress can do to aid the recovery efforts." 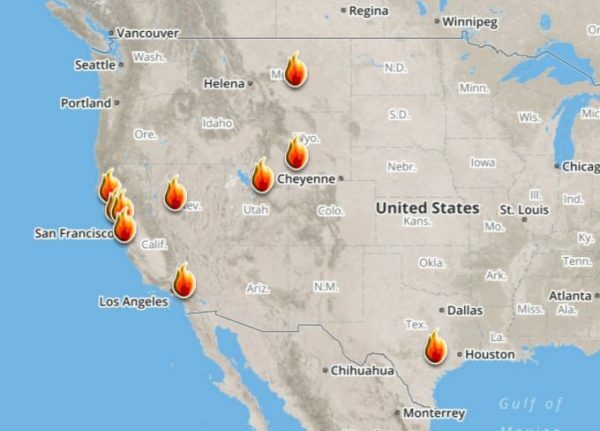 Here's a look at the current wildfire map across the country. While several fires are still ongoing, fire weather conditions have been improving a bit for folks in the Western US. It certainly has been a fairly active first half of 2017 with 1,463 preliminary tornado reports through October 28th. Note that this is the most tornadoes through that date since 2011, when there were 1,897 reports. The map below shows the distribution of the tornadoes so far this year. According to NOAA's SPC, the PRELIMINARY 2017 tornado count is 1,463 (through October 28th). 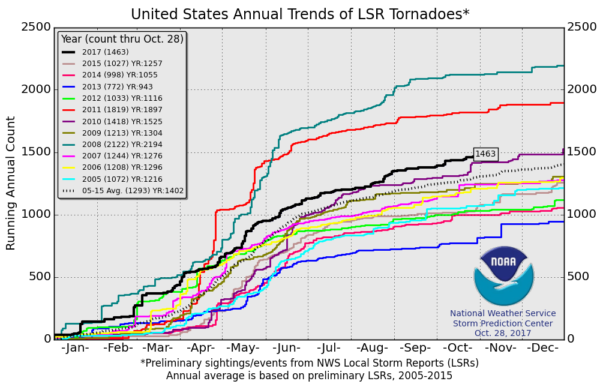 Note that is the most active year for tornadoes since 2011, when there were 1,897 tornadoes. Keep in mind there was a major tornado outbreak in the Gulf Coast region from April 25-28, 2011 that spawned nearly 500 tornadoes, some of which were deadly. 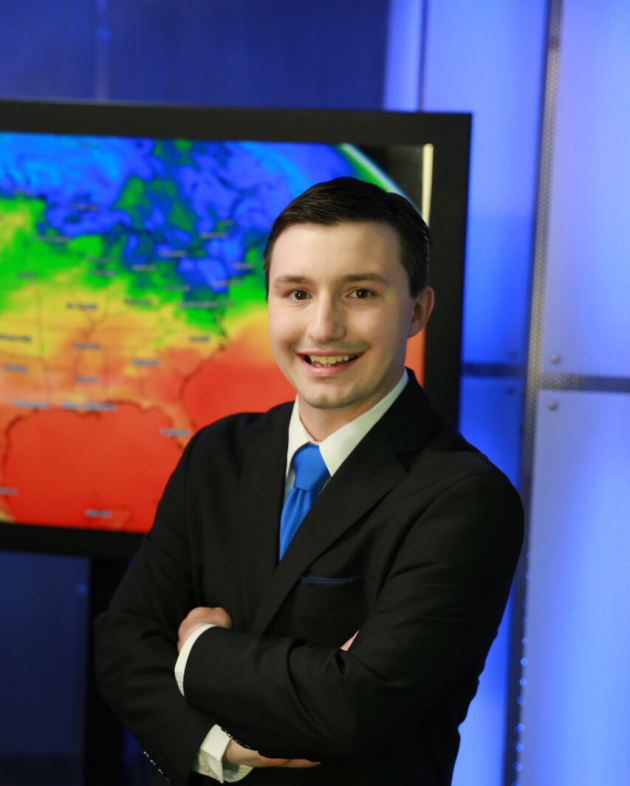 That outbreak is known as the Super Outbreak of 2011 and has gone down in history as one of the biggest, costliest and one of the deadliest tornado outbreaks in history. 1.) High winds across portions of the Northeast, New Jersey, and the Great Lakes, Mon, Oct 30. 2.) 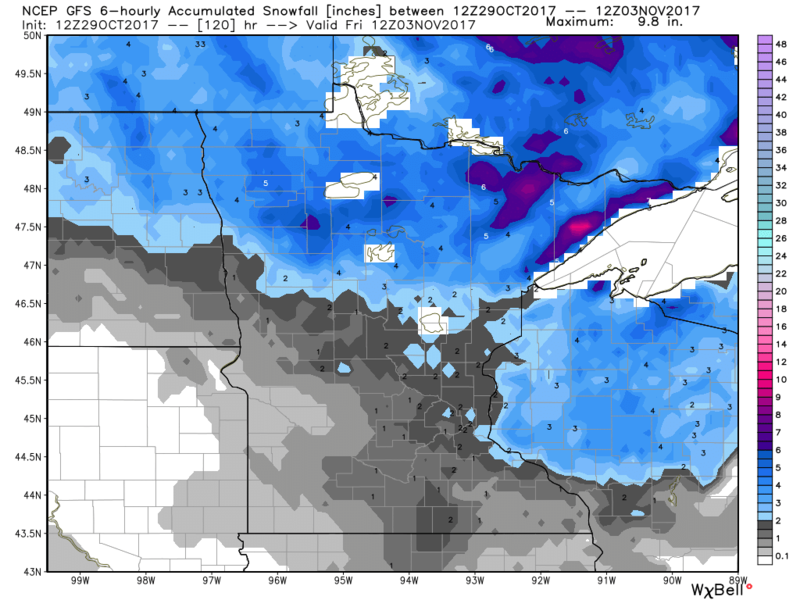 Heavy snow across portions of the Great Lakes and the Upper Mississippi Valley, Mon-Tue, Oct 30-Oct 31. 3.) 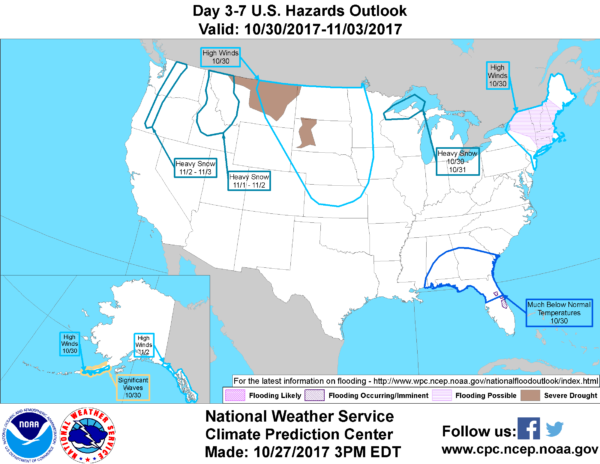 High winds across portions of the Central Plains, the Northern Plains, the Middle Mississippi Valley, and the Upper Mississippi Valley, Mon, Oct 30. 4.) 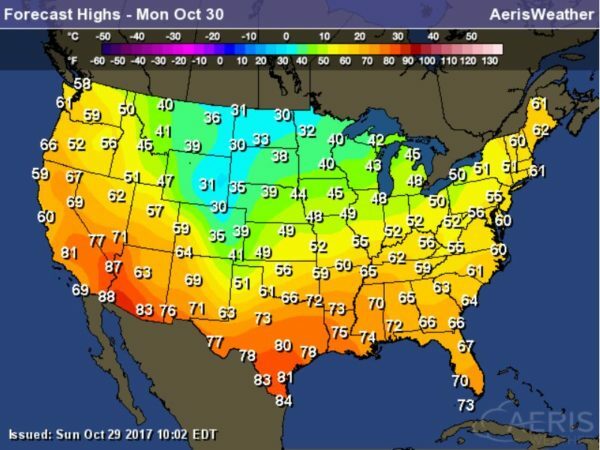 Much below normal temperatures across portions of the Southeast, Mon, Oct 30. 5.) Heavy snow across portions of the Northern Rockies and the Northern Great Basin, Wed-Thu, Nov 1-Nov 2. 6.) Heavy snow across portions of the Cascades, Thu-Fri, Nov 2-Nov 3. 7.) High winds across parts of the South Coast of Alaska and the Aleutians, Mon, Oct 30. 8.) High significant wave heights for coastal portions of the South Coast of Alaska and the Aleutians, Mon, Oct 30. 9.) High winds across portions of the Alaska Panhandle, Thu, Nov 2. 10.) Heavy snow across portions of the northern Sierras, Cascades, Idaho, Northern Great Basin, and Northern Rockies, Sat, Nov 4. 11.) High winds across portions of the Central Plains, the Central Rockies, the Central Great Basin, the Southern Rockies, the Southern Plains, and the Southwest, Sat-Sun, Nov 4-Nov 5. 12.) 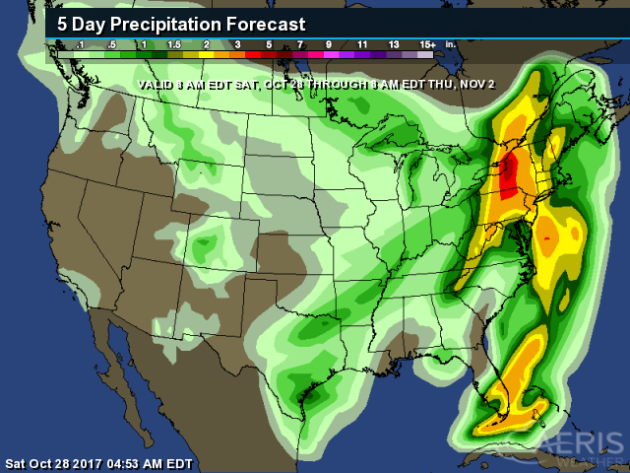 Heavy rain across portions of the Central Plains, the Lower Mississippi Valley, the Tennessee Valley, the Middle Mississippi Valley, the Southeast, the Southern Plains, and the Ohio Valley, Mon-Wed, Nov 6-Nov 8. 13.) 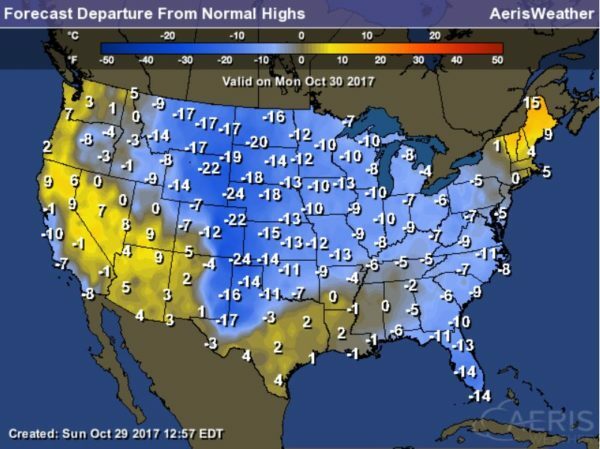 Slight risk of much below normal temperatures for portions of the northwestern and North-Central CONUS, Sat-Thu, Nov 4-Nov 9. 14.) Moderate risk of much below normal temperatures for portions of Montana, Sun-Wed, Nov 5-Nov 8. 15.) Severe Drought across the Northern Plains, the Northern Rockies, and Hawaii. 16.) 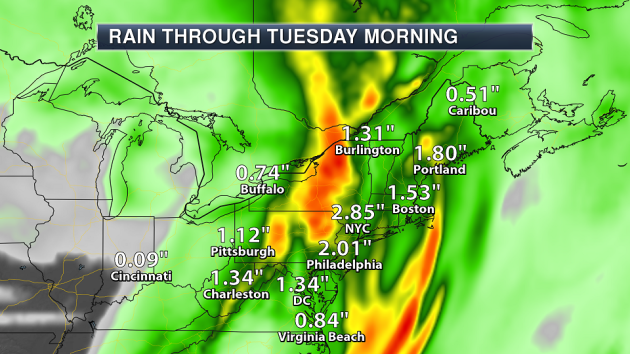 Flooding possible across portions of the Northeast and the Great Lakes. 17.) Flooding occurring or imminent across portions of the Southeast. 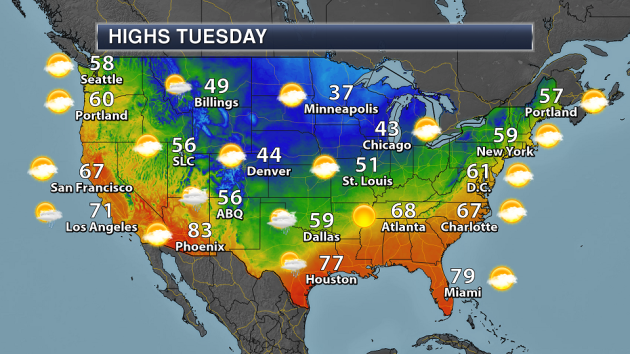 Here's a look at high temperatures across the nation on Monday, which suggests that temperatures across much of the nation will be well below average. Folks along the Front Range of the Rockies will see some of the coolest readings, where temps could be nearly 20F+ below average! However, areas in the Southwest will still be running 5F to near 10F above average. Here's the weather outlook through the middle part of the week, which shows strong winds and heavy rain across the Northeast wrapping up early this week. Folks in the Midwest will remain fairly active as storm systems continue to roll through with areas of rain and snow. There will also be heavier rain developing across parts of the Southern Plains early this week as well! According to NOAA's WPC, areas of heavy rain will continue across parts of the Northeast as the strong storm continues there. Some spots could see as much as 3" to 6" before the system wraps up early in the week. Also note that some areas in the South-Central US could see up to 1" of rain or more, while folks in the Northwest could see as much as 2" of liquid or more. 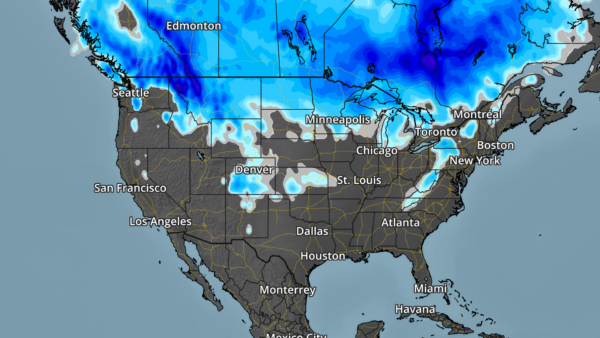 Here's the snowfall potential over the next 5 days, which shows the heaviest snow falling across parts of Canada, but there will be some snow across parts of the Rockies and the northern tier of the nation, including more across the Midwest. The leaves are leaving and so are the snow birds. You think they know something we don't? A few spurts of reluctant warmth are on the way, but long range models look pretty cold. I wouldn't be at all surprised to see snow on the ground for Thanksgiving this year. By the way, there is such a thing as a "reverse snow bird". A friend, Tom Skilling, is Chief Meteorologist at WGN-TV in Chicago. He bought a place up in Alaska, to increase his odds of seeing (real) snow and bitter cold! Only the brave and hardy trek north in midwinter. With a sun angle as high in the sky today as it was on February 10, cold fronts are as inevitable as internet snark. 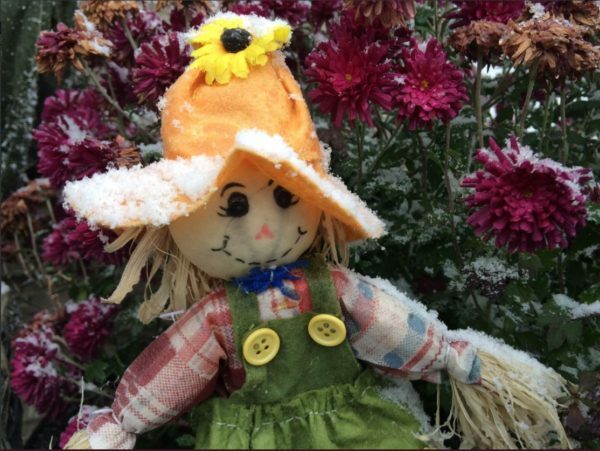 A few decorative flurries float past your window today, but Halloween looks dry with temperatures stuck in the 30s. The best chance of (rain) showers comes Wednesday, again Saturday as a warm front makes a pass at Minnesota. Delay leaf-raking & dock removal until Sunday, when the mercury may surge all the way into the 50s. How far we've fallen. Give it a couple of months. By January FREEZING will be considered a "warm front". MONDAY: Cold wind, few flakes. Winds: NW 15-30. High: 39. MONDAY NIGHT: Breezy and cool. Slight chance of a light rain/snow mix. Winds: WNW 10-15. Low: 28. TUESDAY: Sunny peeks. A chilly Halloween. Winds: SW 7-12. High: 38. WEDNESDAY: Light showers. Sloppy mix north. Winds: S 10-15. Wake-up: 30. High: 44. THURSDAY: More clouds than sun. Probably dry. Winds: NW 8-13. Wake-up: 32. High: 45. FRIDAY: Mix of clouds and sunshine. Winds: N 5-10. Wake-up: 31. High: 42. SATURDAY: Showery rain. Cool and damp. Winds: SE 10-15. Wake-up: 33. High: 44. SUNDAY: A bit milder. Lingering showers. Winds: W 8-13. Wake-up: 41. High: 52. 1951: An early snow storm drops as much as 8 inches of snowfall in north central Minnesota. Mora had 8 inches, while Long Prairie received 6 inches. Glenwood, Little Falls, Morris, and New London all had 5 inches of new snow. Meanwhile, surrounding areas received a couple of inches. 1936: An intense dust storm causes damage in Central Minnesota. Heavy wind damage is reported in Stearns County. "Nov. 4, 1:23 a.m. EST – Full Beaver Moon. This was the time of year when the old Native American tribes set beaver traps, to ensure a supply of warm winter furs before the swamps froze. Another interpretation suggests that the name Beaver Full Moon comes from the fact that the beavers are now active in their preparation for winter. It's also called the Frosty Moon." Highs on Monday will be quite chilly for the end of October as highs hover in the mid/upper 30s to around 40F across much of the state. 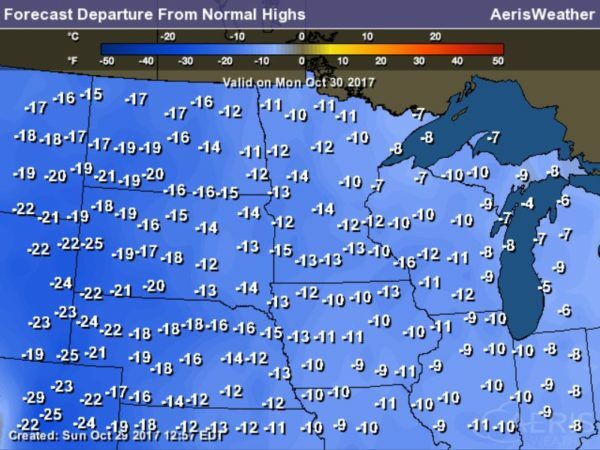 In fact, temps will be running nearly 10F to 15F below average. Here's the simulated radar across the Upper Midwest from Monday to midday Wednesday, which suggests areas of light precipitation continuing through the day Monday and starting up again on Wednesday. 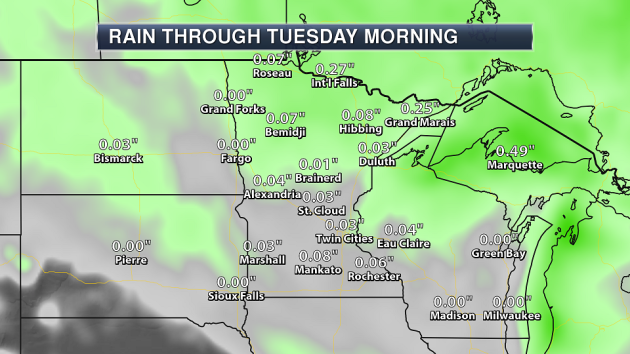 Here's a look at how much precipitation could fall through the end of the week. Some spots across the Arrowhead could see up to 0.5" of liquid or more. Here's the snowfall potential through Friday, which suggests more slushy accumulations possible across the northern part of the state. Some spots could see up to 2" to 4" with some isolated higher amounts, especially across the Arrowhead. 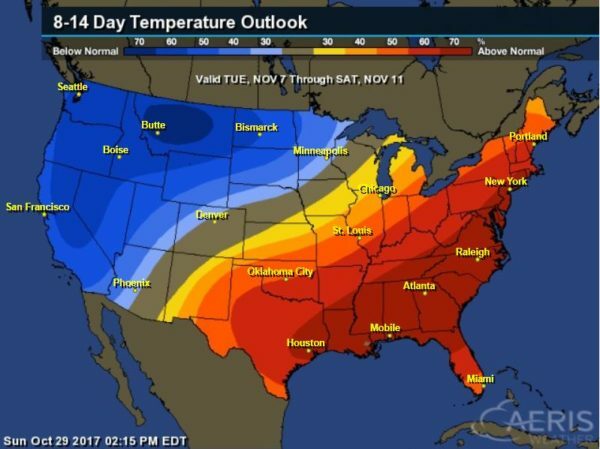 Here's the temperature outlook through November 13th, which shows chilly temps continuing through the end of the month and into the first half of the November. It looks temps by the 2nd week of November could be VERY chilly with highs only in the 30s. It's been a fairly wet October with many areas seeing 2" to nearly 4" of liquic, but a few locations have seen 4" to 8"+ of liquid, some of which included snow! 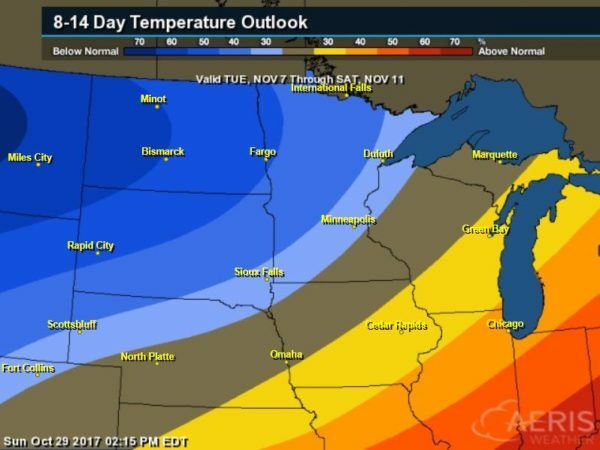 According to NOAA CPC, there is a good chance that below average temps will continue across parts of the Midwest into the first part of November. "Balloon Watches for Sharks and Hurricane Damage"
"Tethered balloons equipped with sophisticated cameras can survey threats and damage from an elevated perspective. A versatile new technology called smart balloons can help monitor two potentially threatening dangers -- great white sharks and high-category hurricanes. Each balloon, tethered to the ground, floats high above the seascape or landscape while its cameras shoot still photos or stream video of the scene below. Land-based operators can order the balloons' cameras to zoom in on eye-catching items. 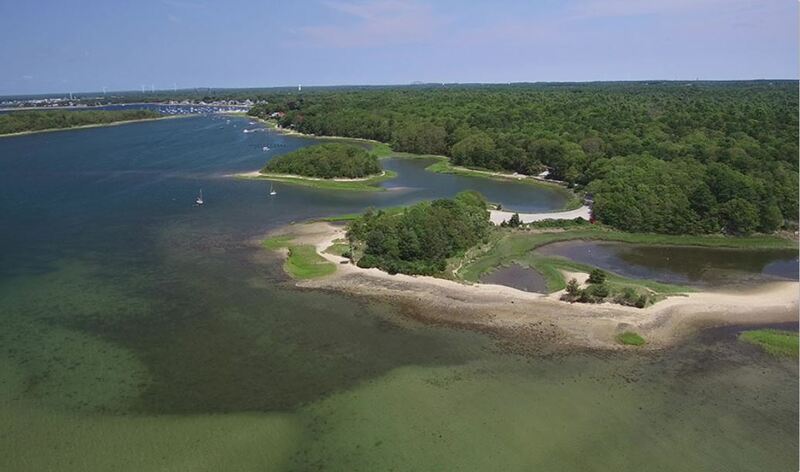 The balloons' cameras can detect sharks close to shore, allowing lifeguards to warn swimmers and beachgoers of their presence. The cameras can also track damage from hurricanes on land and water, thus permitting local authorities to prioritize cleanup tasks. And they can spot disturbances in crowds at sports events and other large gatherings, and identify the individuals responsible. 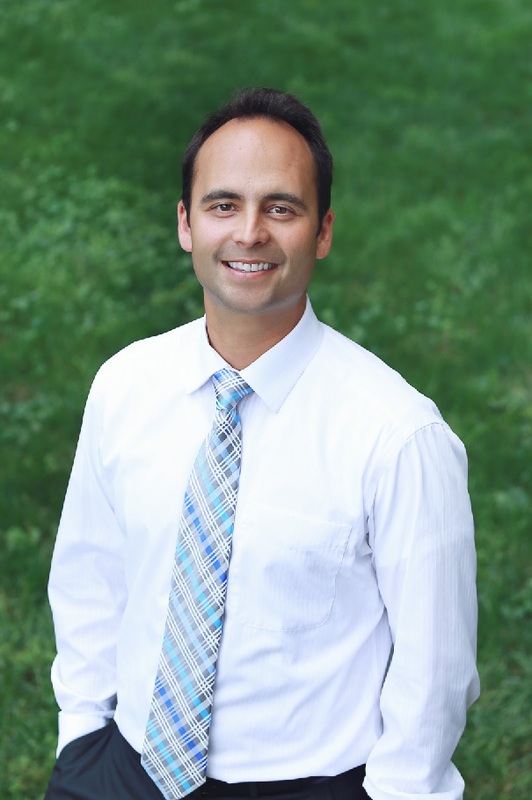 John Ciampa, CEO and founder of the Miami company Altametry, began working on the balloons six years ago, with a grant from the National Science Foundation and help from two universities in Florida. He developed what the company calls SmartBalloons." 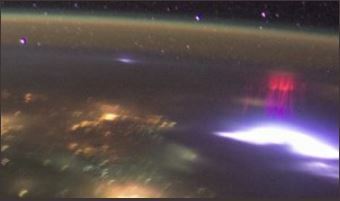 "Blue jets, red sprites and other flashes"
"Was the Extreme 2017 Hurricane Season Driven by Climate Change?" "Global warming already appears to be making hurricanes more intense. Summer and fall 2017 saw an unusual string of record-breaking hurricanes pummel the U.S. Gulf Coast, eastern seaboard, Puerto Rico and the Caribbean. Hurricane Harvey brought unbelievable floods to Houston. Irma, one of the two strongest hurricanes ever recorded in the northern Atlantic,wreaked havoc on Florida and many Caribbean islands. Maria devastated Puerto Rico and the Virgin Islands. The destruction begs the question: Has climate change influenced these extreme events? 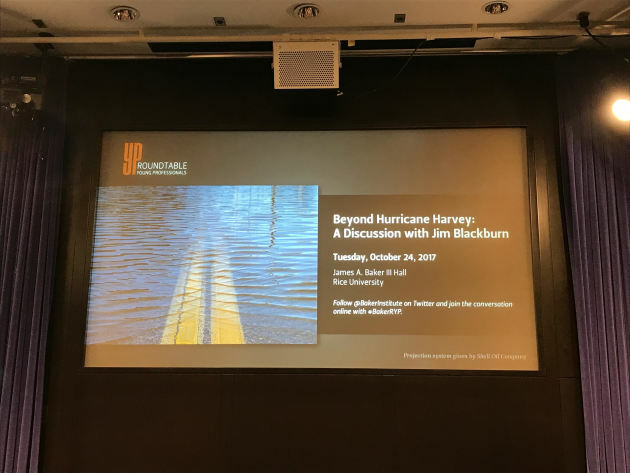 Hurricanes can be difficult to decipher, but experts are gaining a sense of what our warming world might mean for monster storms in the U.S. and worldwide." 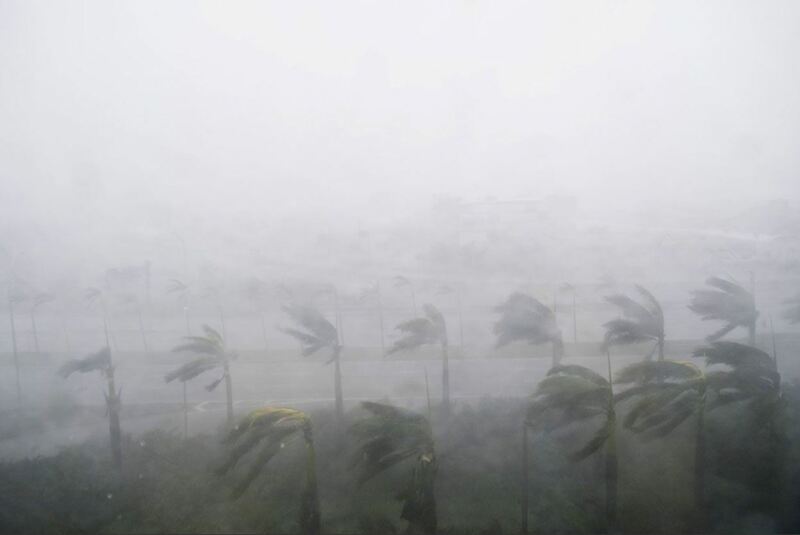 "La Niña forecast may mean even worse Atlantic hurricanes in 2018"
"Following a barrage of storms – such as Harvey, Irma and Maria – it seems like this year’s hurricane season may be one for the record books. 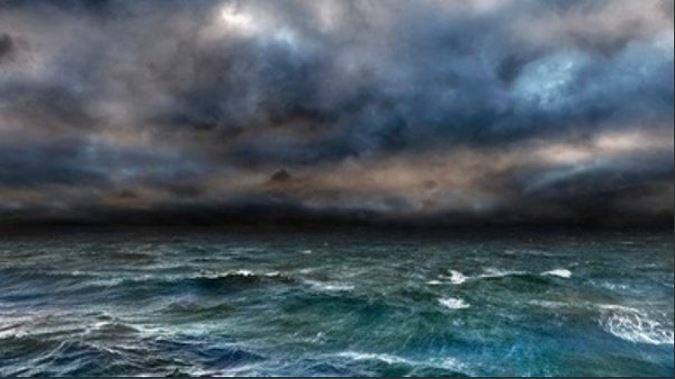 But the Atlantic Ocean may be roiling even more strongly next year, if the La Niña that looks likely to arrive in the coming months persists into next summer. There is a 55 to 65 per cent chance that La Niña will make an appearance before the US winter sets in, according to the winter outlook released last week by the US National Oceanic and Atmospheric Administration. La Niña is one of two phases of the El Niño Southern Oscillation (ENSO), a repeating change in surface ocean temperatures near the equatorial Pacific that affects climate patterns from the Pacific to the Atlantic. The two ENSO phases act like a seesaw between the two oceans, intensifying hurricane activity in one while weakening it in the other. La Niña conditions tend to enhance such activity in the Atlantic and reduce it in the central and eastern Pacific, whereas El Niño does the opposite." 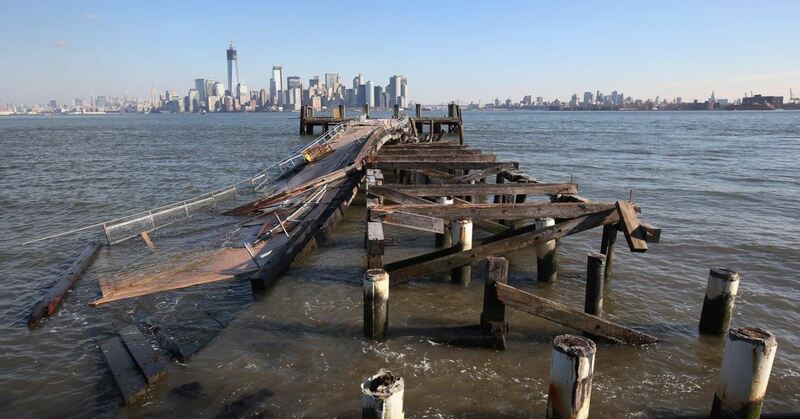 "Here's how New York City is preparing for the next Hurricane Sandy"
"Hurricane Sandy, which happened five years ago this week, notably exposed the dire need to improve New York’s infrastructure so that it can stand up to the increasing threat posed by sea level rise. In the years since the storm, city and state agencies have put many different resiliency efforts into place with the goal of protecting NYC from future—and undoubtedly more frequent—storms. Many of those measures are now in various states of completion. The reconstruction of the Rockaway Boardwalk, for example, has already wrapped up. But others—like a plan to bring new energy generation capacity to Hunts Point, where a power outage would be disastrous for food-processing facilities—are still in the conceptual phases. Perhaps the most high-profile of these resiliency efforts were those awarded federal funds through the Department of Housing and Urban Development’s 2013 competition Rebuild By Design. “New York can benefit from a lot of wisdom tempered by calamity,” wrote New York magazine architecture critic Justin Davidson in 2014, when the competition’s local winners were announced. And it rings true: Danish architect Bjarke Ingels’s firm proposed a series of levees that was awarded a $335 million slice of the disaster-recovery pie, and that are now being designed." "A 'firenado' is a real thing — here’s how the dangerous phenomenon forms"
"Firenados, or fire tornados, can form out of the winds and extreme heat of wildfires. Firenados can move quickly and reach temperatures of 2000°F, so even though they normally last just a few minutes, they can cause severe destruction. Following is the text of the video. This is a "firenado," or fire tornado. It formed out of wildfires in Arganil, Portugal. Firenados are swirling columns of fire, but they aren't really tornados. Tornados result from conditions high in the atmosphere. Firenados form because of conditions on the ground. Hot, dry air rises rapidly and forms a column. That column of air begins to swirl. As it gains speed, it picks up flaming embers and debris. Then it becomes a blazing tower of fire. Firenados are similar to dust devils, but with fire instead of dust. 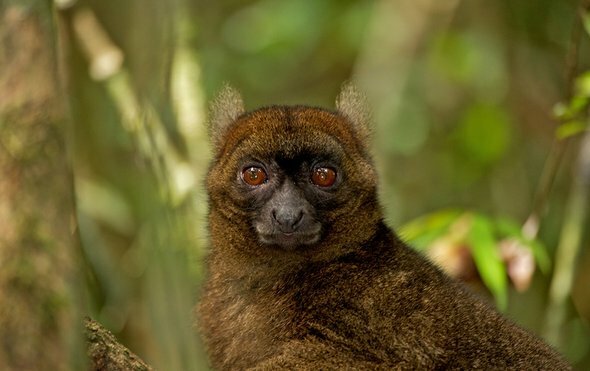 They can reach temperatures of 2000°F and be hundreds of feet tall. They normally only last a few minutes, but that's enough time to cause serious damage and endanger lives." 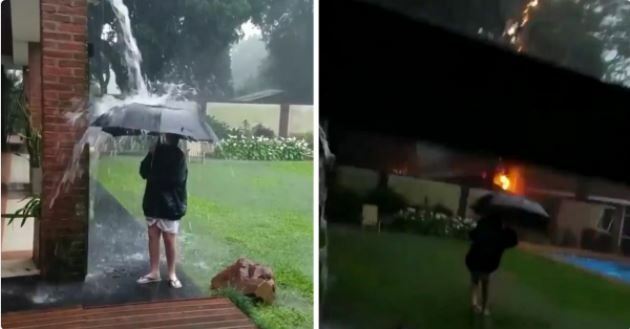 "Video Captures Moment 12-Yr-Old Boy Nearly Struck by Lightning While Playing in Water with Umbrella"
"A close call for one boy in Argentina was caught on video by his mother, and the dramatic footage provided by AccuWeather has spread widely via social media this week. According to the New York Post, the incident occurred in the city of Posadas as the 12-year-old stood under a drainpipe while holding an umbrella during the Oct. 21 storm. Shortly after the boy took a step into the yard, the video reveals a bolt of lightning struck perilously close to him. Reports indicate the bolt hit a nearby tree and set a portion of fence on fire. The footage cuts out at that point as his mother, Carolina Kotur, drops the phone she had been using to record." Looking at the snowfall analysis map, we can see that most of the heaviest snow fell across portions of northeastern Minnesota and into northern Wisconsin. Yellow indicated totals over 6", with orange indicating over 8" of snow. The official total at Duluth was 10.6", making Friday the snowiest October day on record for the city. So why did the storm produce more snow than expected? 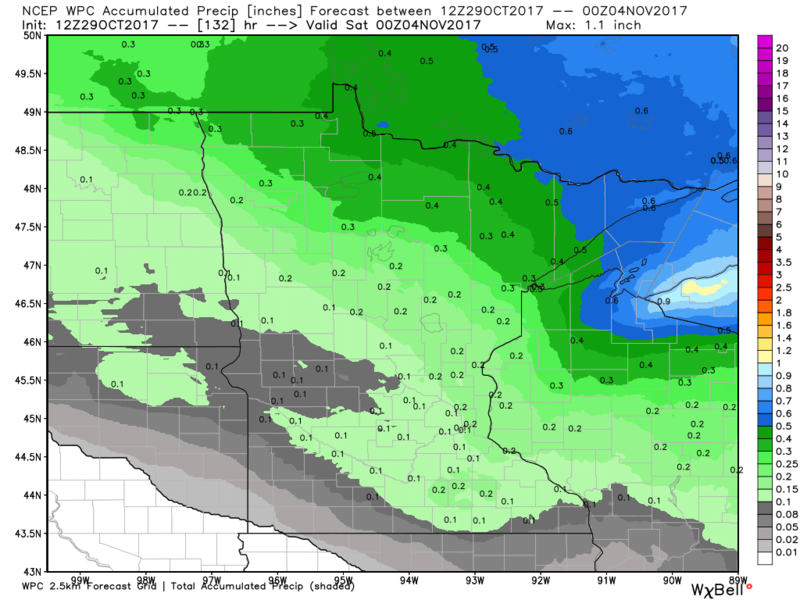 NWS Duluth meteorologist Carol Christenson gave an interview to the Duluth News Tribune answering that very question: "Christenson said forecasters knew there was going to be a lot of snow in the Arrowhead region with this storm, but the Duluth area got more than anticipated because of a lifting effect. Strong winds coming off of Lake Superior were forced upward — called orographic lifting — creating more snow and pushing it into higher elevations in areas such as Duluth Heights, Proctor, Hermantown and parts of Carlton County. Cold winds rolling over the relatively warm waters of Lake Superior probably contributed to more snow, along with rain changing to snow earlier than anticipated." Snow totals were considerably less across southern Minnesota, with only a tenth of an inch accumulating at the Twin Cities airport. Winds were also helping to blow that snow around, which decreased visibility Friday. Winds gusted over 30-40 mph across the state. 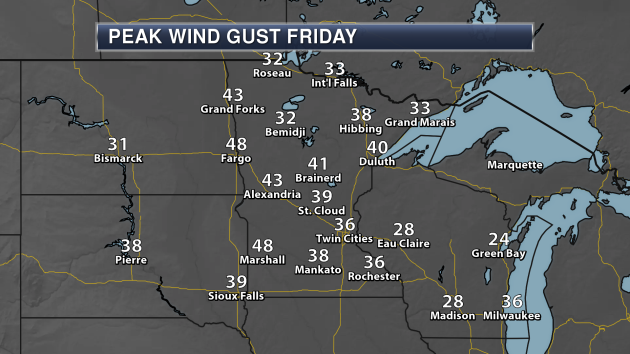 The peak airport wind gust was recorded at the Duluth Sky Harbor airport, which gusted to 63 mph at 1:14 AM Friday. These strong winds helped to whip up large waves on Lake Superior, which ended up doing damage along the lake shore in Duluth. Damage was reported along the lakewalk, at Brighton Beach and at Glensheen. 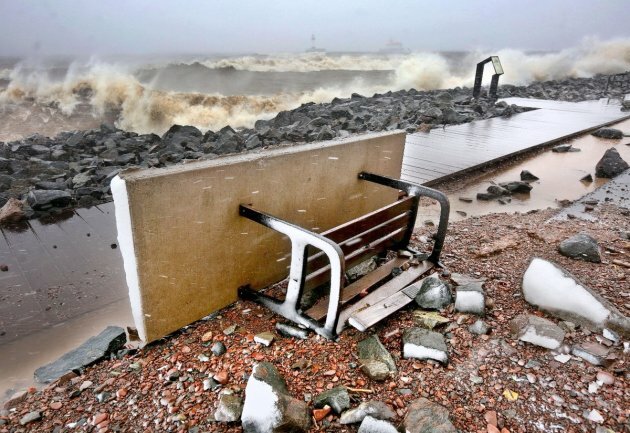 Much more on the damage can be found from the Duluth News Tribune: "Sections of Lakewalk boardwalk were dislodged and tossed about by the waves, and much of the path was covered by rocks and other debris. The city closed the Lakewalk from Endion Station to and including the Portland Malt Shoppe stairway until further notice because of the damage, and there were barriers up because of additional damage near 16th Avenue East." Here in the Land of Low Weather Expectations 32F feels considerably worse in October than it does in March. The first snow sparks irrational fear. It's the cold storms, snow falling at temperatures colder than 15F, that make me nervous - when chemicals can't effectively melt the snow and ice. According to Sperling's Best Places, which analyzed natural disaster data, the Twin Cities is the 7th safest large metro area in the USA. Only cities like Salt Lake City and Portland are safer. We see a tornado from time to time, but nothing like the southern USA, where tornadoes, hurricanes & floods mean the highest risk cities are Oklahoma City and Austin to Miami. Feeling better? It was worth a shot. The atmosphere should be just warm enough aloft for rain showers today. Flurries race past your window tomorrow, with a harsh breeze and 30s. Winds ease up a bit Halloween with some sun, but it will be chilly. SUNDAY: Light rain showers. High 45. Low 33. Chance of precipitation 70%. Wind SW 8-13 mph. MONDAY: Cold wind, passing flurries. High 39. Low 27. Chance of precipitation 40%. Wind NW 15-25 mph. TUESDAY: Some sun, risk of a vampire. High 41. Low 30. Chance of precipitation 10%. Wind SW 7-12 mph. WEDNESDAY: Overcast & windy, risk of a shower. High 44. Low 35. Chance of precipitation 30%. Wind S 10-20 mph. THURSDAY: More clouds than sun. High 46. Low 32. Chance of precipitation 20%. Wind NW 8-13 mph. FRIDAY: Another chance of rain showers. High 42. Low 34. Chance of precipitation 60%. Wind NE 8-13 mph. SATURDAY: Mostly cloudy, shower or sprinkle? High 48. Low 38. Chance of precipitation 40%. Wind SE 8-13 mph. 2004: Exceptionally muggy conditions for October are felt over much of the state. Dew points surged into the middle to upper 60's over central and southern Minnesota. Ladybugs are extremely active. 1955: Early snow hits the Twin Cities, accumulating to 2.2 inches. 1905: Several inches of snowfall accumulate in south central Minnesota. Snow totals included 7 inches at Fairmont, 6 inches at Farmington, 4.5 inches at Montevideo, 4 inches at Faribault, and 3 inches at New London. 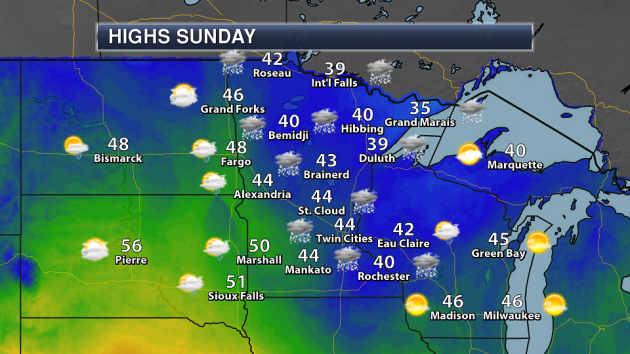 A frontal system will be passing through the state Sunday, bringing a chance of rain and snow with it to Minnesota during the morning hours, changing to rain by the afternoon. 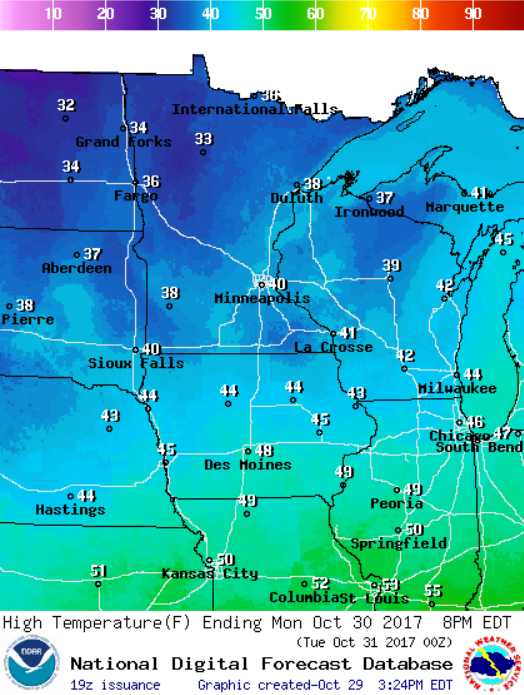 Highs will be in the 30s and 40s in most spots, though parts of southwest Minnesota could top 50. Highs across the entire state Sunday will be below average for this time of year. 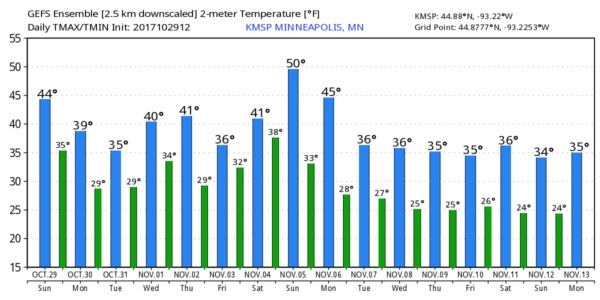 We'll see highs remain in the 30s and 40s for the next week here in the Twin Cities, with no real warm up possible until next weekend according to some of the models. With a couple systems passing through the next few days, we will be watching the chance of accumulating precipitation. Accumulations are expected to be light across most of the state, with the heaviest occurring across far northern Minnesota. We have several chances of precipitation with a number of systems passing over the region in the next week to week and a half here in the Twin Cities, with totals potentially topping a half of an inch. With a couple snow chances in the forecast Sunday and again Monday, we could see some accumulation across mainly northern Minnesota. 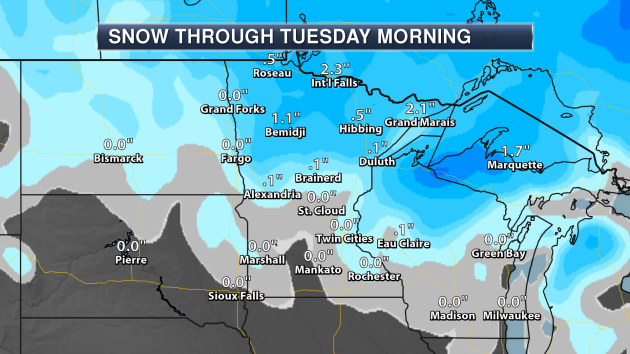 Both International Falls and Grand Marais could pick up over 2" of snow through Tuesday morning. Snow totals are expected to be minimal across central and southern Minnesota. Take a look toward Halloween - it currently looks dry across the state of Minnesota. Highs are only expected to be in the 30s throughout the state (barely reaching freezing across northern Minnesota), so make sure you bundle those kids up as they head out trick-or-treating during the evening hours! 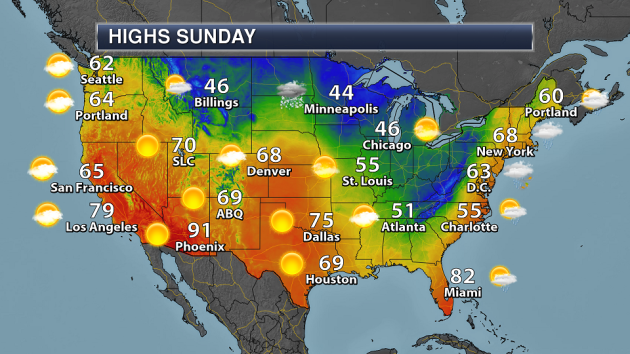 A cold front will continue to push east as we head through the day Sunday, bringing cooler weather along with it by Monday to the east coast. However, a coastal low will also develop, bringing the Northeast heavy rain throughout the day and strong winds by Sunday night. 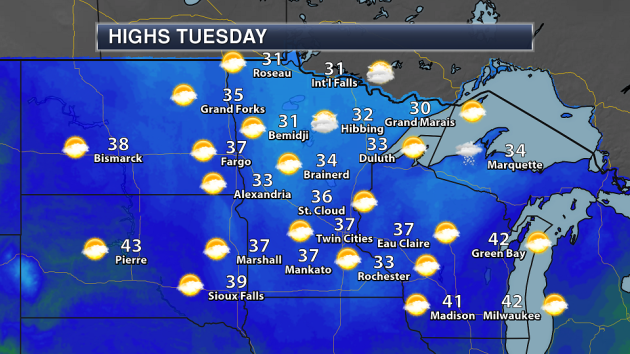 Another system across the upper Midwest will bring the chance of rain and snow to the region. While some rain and snow will also be possible with a cold front dropping south across Montana and Wyoming, the rest of the west will be under high pressure. 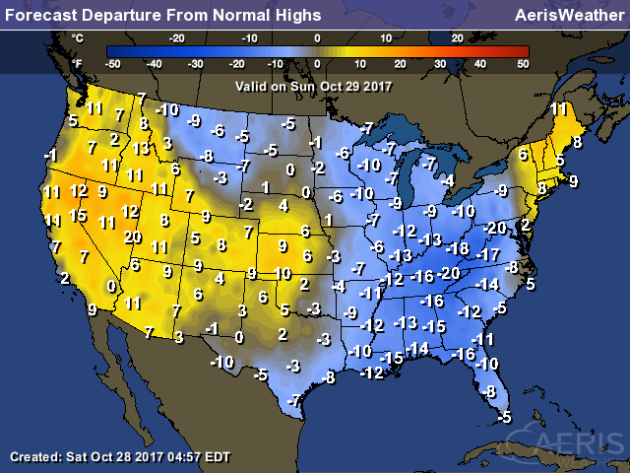 Highs in the wake of cold fronts pushing through the nation will be below average Sunday, in some areas by a good 15-20 degrees. Ahead of the cold front in New England, though, highs will still be above average. The heaviest rain through Thursday morning will be across the Northeast, where some areas could pick up to 6" of rain Sunday into Monday with a coastal low moving through the region. I'll have more on that in just a moment. Looking ahead to Halloween on Tuesday, most of the nation looks to be dry during the day. The best chance of rain looks to be across parts of the Southwest and the Southern Plains. Coastal Low This Weekend. A strong coastal low is expected to form along the East Coast this weekend as a cold front continues to move east. This system will tap into deep tropical moisture, allowing for the potential of heavy rain. Also, as the storm quickly strengthens and moves northward, damaging winds capable of tree damage and power outages can be expected Sunday Night into Monday across the Northeast. Peak Wind Gusts Sunday. Winds will be on the increase during the day Sunday, with wind gusts in the 20 mph range from Caribou to Washington D.C. expected. Peak Wind Gusts Sunday Night. Some of the highest wind gusts are expected Sunday Night into Monday across the Northeast as the system strengthens. Some areas of the Northeast could see wind gusts that approach 60 mph, with the strongest winds expected along the coast and in higher-terrain areas. These winds will be capable of tree damage and power outages, and cause delays at the major airports across the region. Peak Wind Gusts Monday. Winds will continue to be strong due to this system across the region into Monday – especially during the first half of the day - with many areas continuing to see wind gusts in the 40 mph range. Heavy Rain Concerns. This system will have deep tropical moisture available to it – some of which will come from Potential Tropical Cyclone 18 - that it will tap into starting Sunday and lasting into Monday. Widespread amounts of 2-4" can be expected, with isolated higher totals of 6" or more. 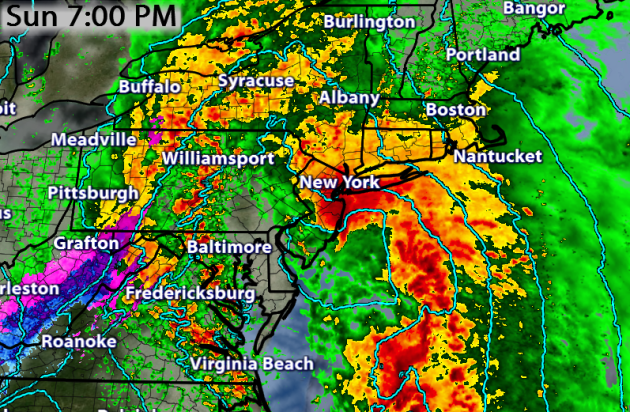 This could lead to flash flooding across the region. Tucson has received no rain so far this month. 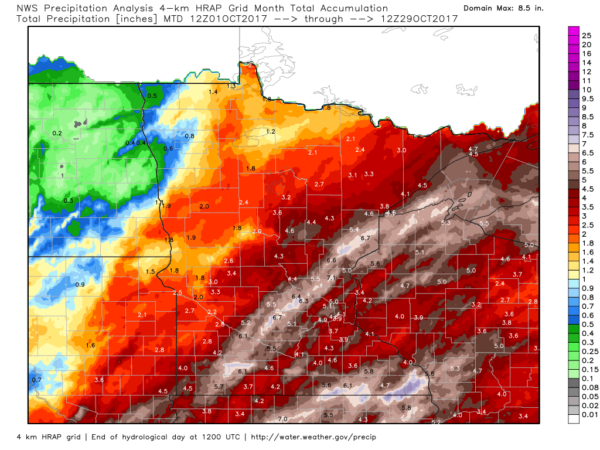 It looks like it may only be the fifth October on record with no rain. More from the Arizona Daily Star: "It appears October will wind up as a dry month, with no rain in sight in Tucson’s metropolitan area for at least a week — maybe more. Since 1948, there have been four times Tucson received no rainfall during October — 1952, 1973, 1982 and 2013, said Jordan Pegram, a National Weather Service meteorologist. This year’s dry stretch could potentially hit two months: Sept. 8 was the last time the city recorded measurable rain at Tucson International Airport. A whole 0.03 of an inch fell."